Q-Cells produces silicon-based photovoltaic cells and supplies the manufacturers of solar modules. In addition to continuously extending our product capacities, we constantly advance our production methods, thus setting industry standards. The goal of our consistent improvements is to increase the customer benefit and implement user-oriented innovations. The Fujihara Lab is researching ceramic materials that have optical functions.This is a unique field called optical energy materials science. The aim is to make ceramics that play a role in optical wavelength modulation and photoelectric conversion, in order to develop ceramics that are more functional and environment-friendly. 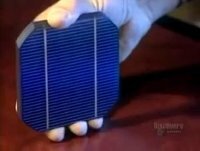 This Discovery Channel video shows you how a solar panel is made, from which this information can be used to easily build a solar panel for home use for under $100. Solar cells, also called photovoltaics (PV) by solar cell scientists, convert sunlight directly into electricity. Solar cells are often used to power calculators and watches. The performance of a solar cell is measured in terms of its efficiency at turning sunlight into electricity. Only sunlight of certain energies will work efficiently to create electricity, and much of it is reflected or absorbed by the material that make up the cell. This educational video explains how solar photovoltaics work, how they create electricity from solar energy, and how photovoltaics actually produce electricity. It them goes on to how the system produces electricity for domestic consumption and how excess electricity can be sold back to the grid. 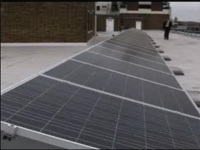 Also shown are the various different types of solar panels that can be used in an installation. This video explains how solar energy is created and compares this to conventional electricity. The various components of a solar power system are explained including photovoltaic cells, inverters and batteries. 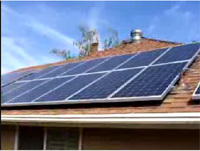 The benefits domestic solar energy systems are also explained. The science behind how a solar cell works is provided in this video. Starting form the production of pure silicon, to the doping of silicon to produce a semiconductor, through to the conversion of solar energy into electricity. 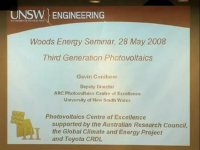 Gavin Conibeer, senior research fellow at the University of New South Wales, discusses approaches to third generation photovoltaics. The Shimane Institute for Industrial Technology has been researching and developing dye-sensitized solar cells (DSC) as a project to create new industry in Shimane Prefecture and has developed a 12cm by 12cm square, highly durable sub-module that has cleared the JIS standard heat-resistance test for the first time in the world. The durability of the new sub-module is comparable to that of widely used silicon based solar cells.